It was hotter than Hell yesterday, but today it’s cool in Paradise (Texas). Not only did the heat wave end, giving us a beautiful day, but our new 15,000 BTU air conditioner was installed and is now chilling out the Airstream. We don’t really need the AC today, but hey, we’ve got it finally and I want to make sure the unit is solid (not about to have a “crib death” as electronics sometimes do) before we drive away. The refrigerator, however, is another story. No “smoking gun” issue was found. It seems to be slowly failing for an unknown reason. We found no sign of leaking coolant, no blockage in the vent, no ammonia smell, and it works equally badly on electric and gas. This points to internal blockages in the cooling unit, which are not repairable. The cooling unit has to be replaced, or the entire refrigerator. Since it’s working a little (the freezer still makes ice but the refrigerator warms up to 50 degrees during the day), it was reinstalled for the trip home. We’ll use it with some bags of ice to complete this trip, then figure out how/when it will be replaced later. The new AC comes with a high-tech looking thermostat which basically does what the last one did but looks cooler doing it. It reminds me of a Samsung front-loading washer. Since we don’t trust the freezer entirely, Eleanor has embarked on a mission to cook up a bunch of the frozen stuff. Last night she made dinner for seven (Paul, Anne, Marvin, Annie, and the three of us) which we ate in Paul & Anne’s house. Tonight we’ll have dinner for five, since Marvin & Annie are leaving soon. Tomorrow, it will be IKEA day: Swedish pancakes and meatballs for brunch before we hoist our moorings and point the ship west. 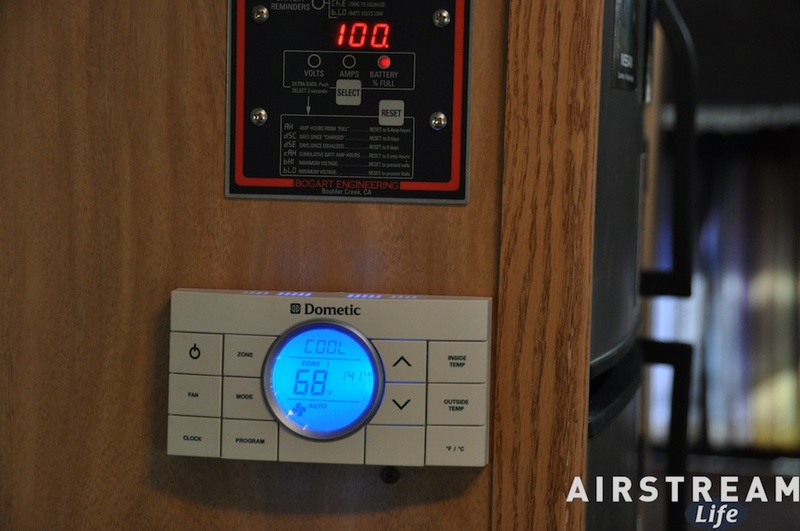 Struggling with the dual appliance failures and talking to Paul, Denver (tech), and Marvin has gotten me thinking about other upgrades and fixes for the Airstream. Marvin & Annie are using a very interesting composting toilet in their 30 foot Argosy trailer, which they are enthusiastic about. It has several advantages: no more black tank, no smell, and the ability to boondock for long periods of time. On the other hand, it’s expensive at about $1k, does require you to empty a urine cartridge regularly, and requires a little user education. You can’t just turn someone loose in the bathroom with this thing and expect good results. I read the manual that comes with it and the manufacturer clearly has a bit of fun with the explanations of What To Do, and Where To Do It. Eleanor and I had a chance to go inspect the Caravel, which is parked nearby, and see the work Paul did on it. It looks great. We asked for a few additional tweaks to the gaucho and battery mount, but nothing major. It will be great to break the Caravel out this winter and perhaps take it to a vintage rally (if we can find one in a reasonable distance) or do a weekend at some tiny campground like the one in the Chiricauha National Monument. It has been great visiting with Paul & Anne, so in a way I’m glad I’ll be making the 900-mile trip back soon to pick up the Caravel in the next few weeks. Things looked hopeful in the morning when our refrigerator was reading 42 degrees, but as the morning sun rose, so did the interior temperature. By 11 a.m. I had conceded that it wasn’t cooling properly on gas yet, and Paul switched it over to electric to see if that worked better. I also turned on our fridge vent boost fans, which we normally use whenever the ambient temp is above 90 degrees. No joy. By 2 p.m. the refrigerator had risen to 52 degrees inside, which suggests the worse possible scenario. These units don’t have a lot of failure modes. When the fridge won’t cool on electricity or gas, and the circuitry has been eliminated as a cause (as proven by use of Paul’s testing device), it usually means the cooling unit is a goner. They aren’t field serviceable, so the only solutions are either a replacement cooling unit or a whole new refrigerator. Either way, it’s bad news. Before we go to the replacement scenario, we’re going to try “burping” the fridge, which basically means turning it upside down for a while to try to work out an internal clog of the gasses and liquids that are essential to the cooling process. That’s a desperation move. 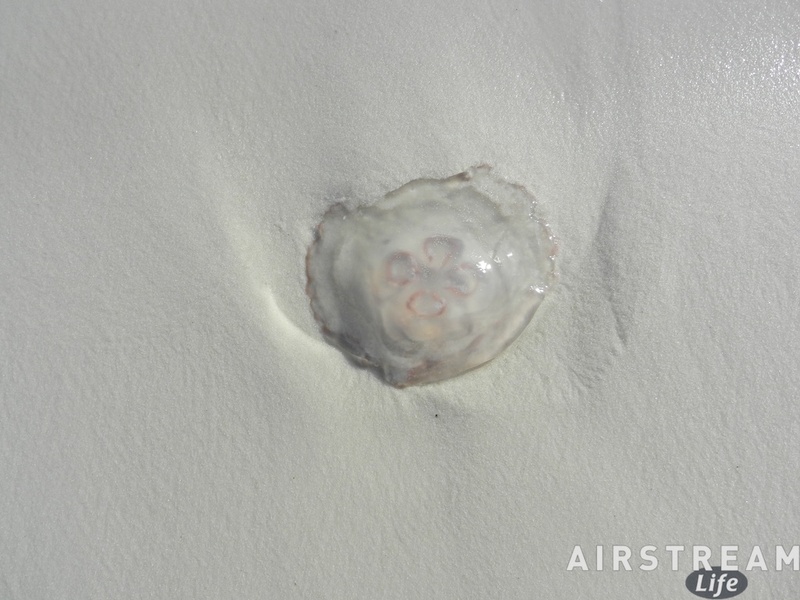 We’ll also remove the topside vent cover to see if perhaps something nested in there during our stay in Vermont. The refrigerator will be removed during this process. If this doesn’t work, we’ll have to consider various replacement options, which are dependent upon shipping and availability. We might have to go home with no refrigerator and donate all of the frozen goodies Eleanor has collected over the summer to Paul & Anne. It’s 100 degrees outside as I write this. Because we have no air conditioning, the trailer interior is also 100 degrees. It would be hotter but our three vent fans running at full speed are keeping us on par with the outdoors. Eleanor had the excuse of grocery shopping for tonight’s dinner as a reason to drive off in the air conditioned Mercedes to an air conditioned store, but Emma and I just toughed it out. 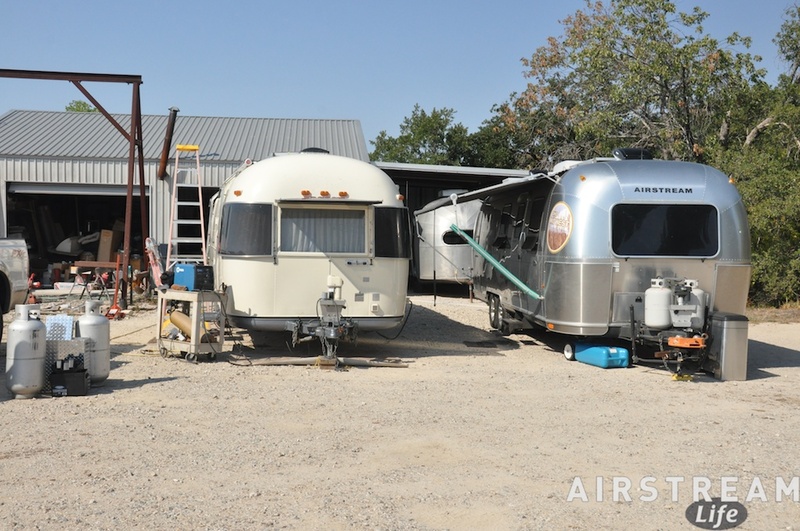 Emma worked on math, and I worked on Airstream Life. When the interior of the Airstream reached 100 degrees, Emma and I went into full-blown Death Valley Cooling Mode. It’s dry here, so evaporative cooling is the trick. We took cold showers and then put on wet cotton t-shirts. I wiped down the dinette seats with wet cloths and rigged up a makeshift evaporative cooler for my laptop too, using a wet rag and a plate. All of this made the heat somewhat tolerable. Good thing, because it would be easy to lose my cool given two expensive appliance failures. The air conditioner is gone after six years, and now the refrigerator is gone after just three years. This will be our third refrigerator. I’m not impressed with the quality of RV appliances — never have been, but this really seals it. I said earlier that they don’t make ’em like they used to, and I meant it. We replaced the original refrigerator in our 1960s-era Caravel after 37 years, and it was still working. (We replaced it only to get a larger modern unit with better cooling control, but now I’m wondering if we made a big mistake.) 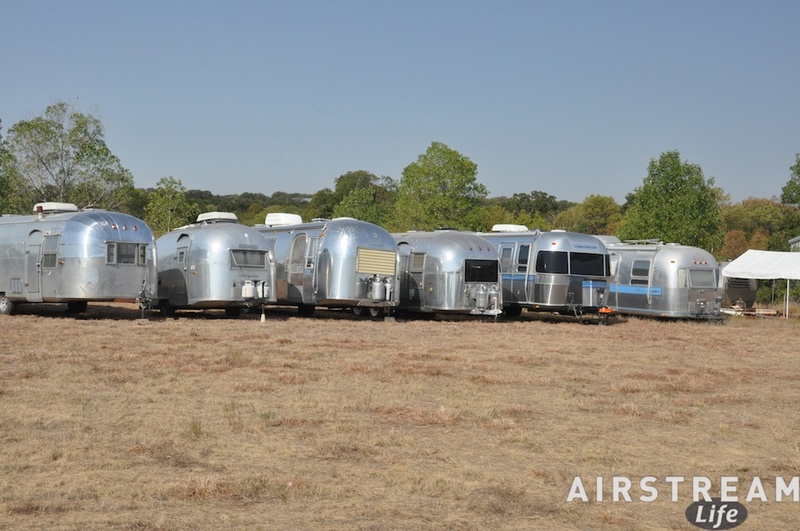 It’s not uncommon at all to find vintage Airstreams with original refrigerators in them. In twenty years, will anyone with an early 2000s-era RV or travel trailer have an original appliance left? This afternoon we relocated all of our refrigerated items to a spare refrigerator Paul & Ann have in their house. We were too late for a roll of biscuit dough, which popped spontaneously in the refrigerator, and our milk is also history. But at least we are in a friendly place with resources. Eleanor is making dinner for Paul & Anne in their kitchen, which will use up some of our food. I know for sure we are having biscuits with dinner. Meanwhile, we’re working on Plans A, B, and C for the next few days, dependent on whether we fix the fridge, replace the fridge, or skip it until later and head home with an ice chest. Remember that 1970s-era Euro-pop tune by Kraftwerk? “Wir fahren fahren fahren auf der Autobahn” (English: We drive drive drive on the motorway) That pretty well sums up the past two days. We just needed to get the Airstream from the panhandle of Florida to north Texas as expediently as possible, and for that job there’s nothing like a nice boring Interstate highway. Load the snacks, the podcasts, and some books and and the Gameboy for Emma — we’re going to check out half a dozen Interstate rest areas along I-10, I-49, and I-20! Woo-hoo! After an unremarkable overnight in Alexandria LA, where the height of excitement was discovering that we had accidentally spent the night parked next to a sign that said “NO OVERNIGHT PARKING,” we plowed up through Louisiana and across north Texas into the dark heart of the Dallas/Ft Worth metroplex. The Louisiana roads were fine, quiet and even a bit scenic, but I do not enjoy the D/FW traffic nightmare when towing. We encountered about 40 miles of construction zones (narrow lanes, signs missing, Jersey barriers) and the usual maniacal drivers making high-speed radical drifts across three lanes right in front of us while texting. Twice we were forced off the road by a combination of “Exit Only” lanes that weren’t marked in the construction zones and drivers who would absolutely not let us enter “their” lanes. At one point I decided to assert the mighty power of a 48-foot rig and almost literally crushed a small econobox that was being obnoxious. He got the message. But most of the time we played nice and tried to be steady and smooth as much as the twisting and crazy construction zones would let us. We survived D/FW once again and eventually emerged on the northwest side near Decatur. We are now parked at Paul Mayeux’s home, where he is running his own 2-man Airstream service center. Long-time readers will recall that last April I left our Caravel here for repairs and never got back to pick it up. So now we have two Airstreams here at Paul’s, 900 miles from home. Our primary reason for coming here was to get a new air conditioner installed. We’re going with a 15K BTU model (high capacity than the 13.5K model it is replacing). We’re skipping the expensive dual AC/heat pump unit because we hardly ever used the heat pump and we have two other sources of heat anyway (furnace and catalytic heater). That saves about $450. 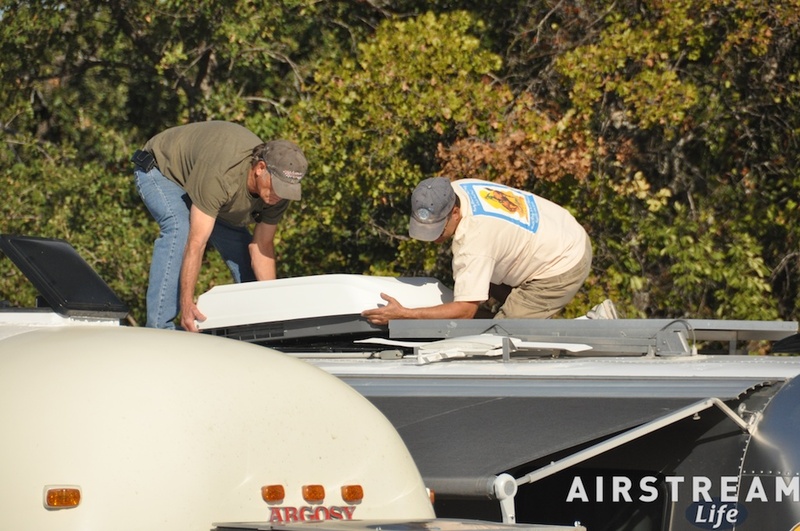 Paul and Denver (who used to work on our Airstream when Roger Williams Airstream in nearby Weatherford was in business) will install the AC on Friday. It always seems that when we get to a service center we find a bunch more things to fix or check. During our last two days of roadtrip we’ve noticed that the refrigerator has climbed up to 52 degrees during the day. That’s very bad, because it could indicate a failing cooling unit, which is very expensive. The fridge has been running on gas during this time, so Paul checked the gas pressure with a manometer first and found that our pressure was below spec. We adjusted the regulator and left the fridge running in a test mode (basically at top cooling capacity) all night to see if it would cool down. This morning it is showing 42 degrees, which is better but not yet good enough. Since it was packed full of food (thermal mass), it may be that a few more hours are needed to reach optimal temp (somewhere in the low 30s). These gas absorption-type refrigerators are very slow to remove heat relative to your home refrigerator that uses an electric compressor. That’s why you have to start them the day before you go on a trip. 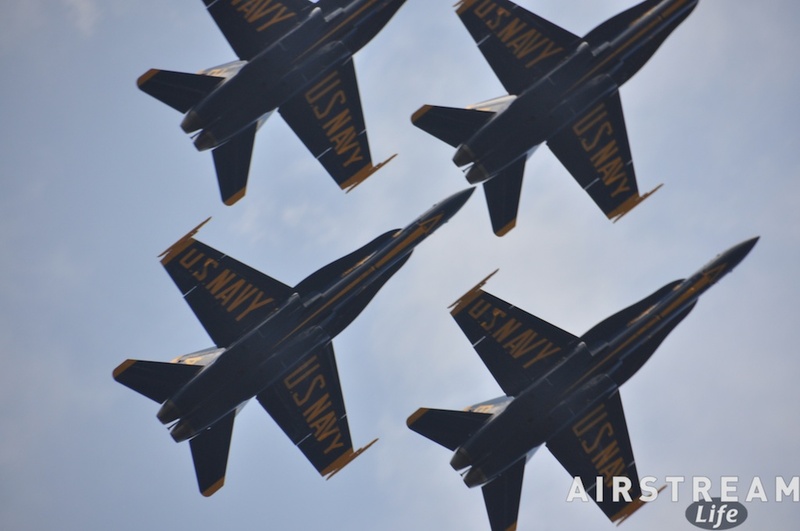 Today we are expecting highs in the upper 90s, so it’s a good test day. If the fridge continues to cool, we’re fine, but if not, we’ll have to dig a little deeper to find the root cause. 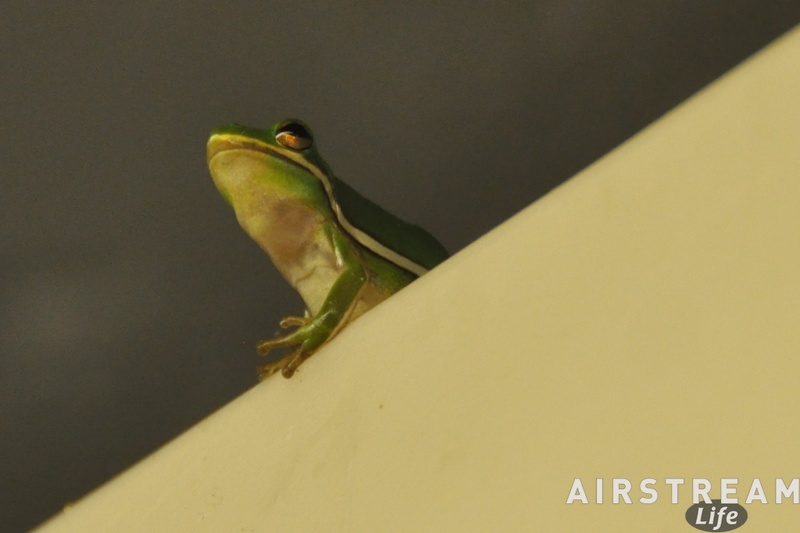 We’ve also noticed that the bathroom vent fan seems to drip a little in the rain even when closed. It probably has a crack in the plastic, so we’re anticipating replacing it on Friday as well. That’s not a major job. Parked next to us is a Canadian couple in an Argosy who are here for installation of solar panels, Marvin and Annie. We’ve met before, way back in 2005 when Project Vintage Thunder was first displayed (unpainted and incomplete) at the Florida State Rally in Sarasota. They remembered us and Vintage Thunder. So it’s like being in a little campground here at the shop. The best news we’ve had so far is that nights up here are cooling down nicely. We’re getting 65 degrees by daybreak, and the humidity is low, so even without AC at the moment it’s very comfortable. We finally used a blanket on the bed last night. And added to that, we zipped up to Decatur last night and got our first Texas barbecue dinner of this trip, which is always something that makes us all happy. I don’t know why, I guess it’s just a tradition now. Memories of other great trips. Nothing to do … isn’t that great? 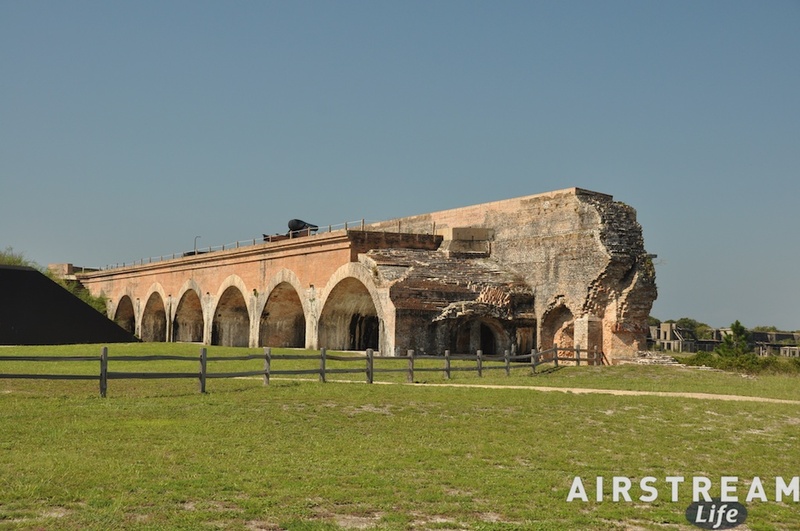 I deliberately booked four nights here at Ft Pickens State Park so that we’d have time on our hands to do nothing. A two or three-night visit is always busy; setting up, seeing the local sites, running an errand, making dinner, etc., until the final tear down, which always comes too soon. With four nights I knew we’d have time to visit the downtown, spread out, see most of the state park, and visit the beach … and then have another day with “nothing special” planned. That’s today. It would be better if today weren’t Monday — the day my phone is most likely to ring and the day I receive the most emails — but the people who really might need to reach me all know better than to expect an immediate response. My motto has always been that there are few true emergencies in a quarterly magazine schedule. Whatever it is, it can wait until Tuesday, when I’ll have lots of time in the car as we tow the Airstream westward along I-10. 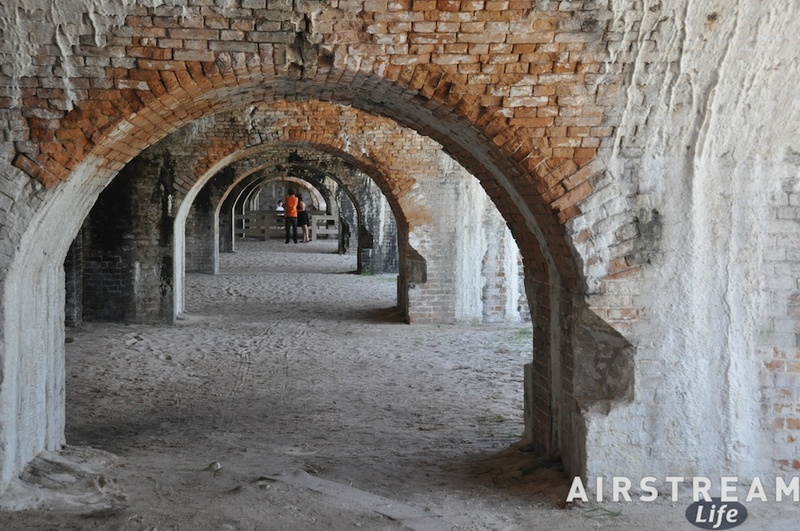 Sunday was our day to visit Fort Pickens, which is only a mile from the campground and technically part of the Gulf Islands National Seashore rather than the state park. I think I was last here in 1983, as a senior in college. Pensacola was one of my favorite hangouts, four hours drive from Baton Rouge in my heavy old hand-me-down 1977 Camaro. I loved coming down here and seeing the dazzling white sands and the long empty stretches of dune covered with sea oats, along Santa Rosa Island. 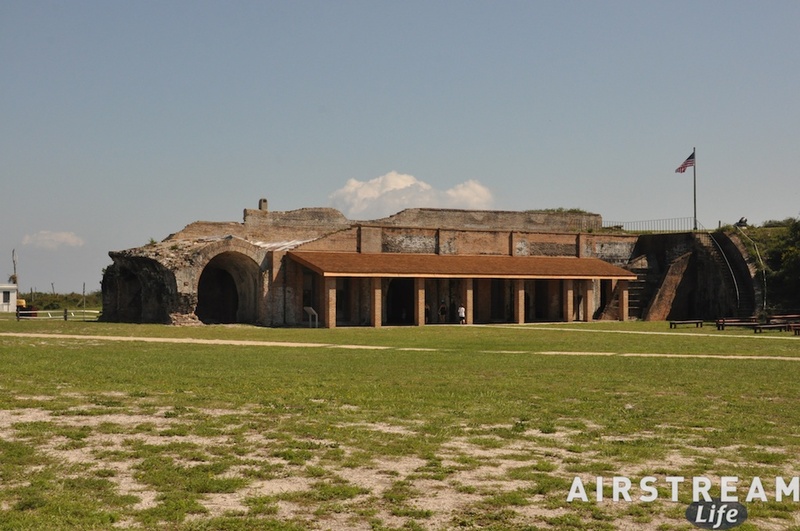 The island has of course changed with the tropical storms and hurricanes that stretch and replenish the island, but Fort Pickens is still the same as I remember. 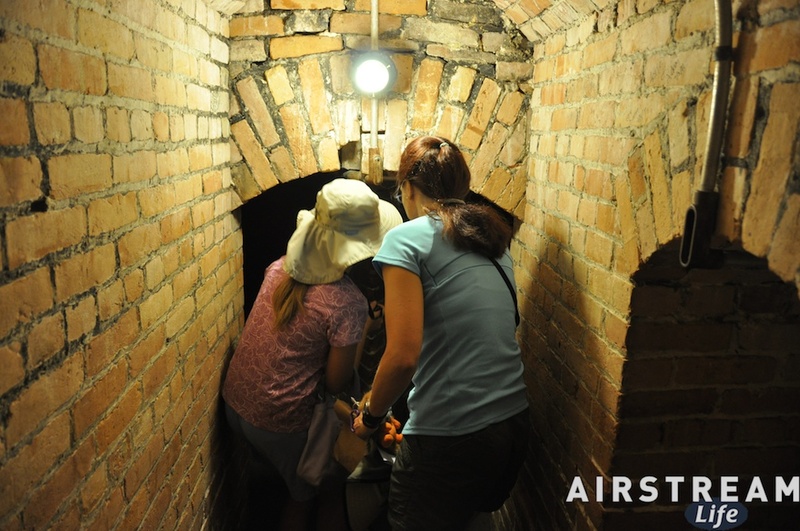 It was fun to show it to Emma and Eleanor, with the ghostly dark passages and dramatic brick arches. The interpretive museum adjacent to Fort Pickens is currently empty, having been devastated by Hurricane Ike, and so all we saw there was a 25-minute video and the historical buildings that now house the park staff. Nearby on the bay side is a small fishing pier, and further along toward the west end of the island is apparently a popular diving spot. 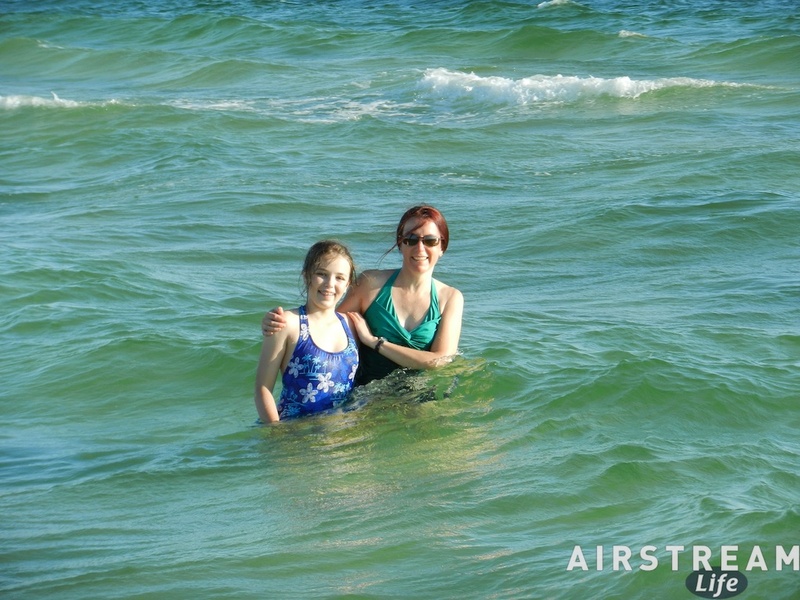 We saw families surf fishing, people zipped past on jetskis and in larger boats, aircraft practicing approaches from the Naval Air Station across the bay, and schools of fish jumping all at once. Yes, it was hot (86 degrees) and humid (don’t ask), but I can see why many people pay the $8 entry free to the National Seashore — there’s so much to do, and the park is beautiful. More than once we were asked by someone where we came from. To keep things simple, we usually just say “Arizona,” rather than try to explain the complexities of our current tour. Then they say, “Oh, well you’re used to this heat!” or “So this is nothing to you!” I guess they think that Arizonans don’t feel the heat. We do; It’s just that we don’t stand around in the direct sun for long when it’s 108 degrees, even if it is only 6% humidity. Since we were out walking in the sun most of the day, we had broken out the same gear (clothing & sunscreen) that we’d wear in Tucson in June. When it came time for our picnic lunch, we chose a fine spot in the shade of a grove of Live Oak trees. 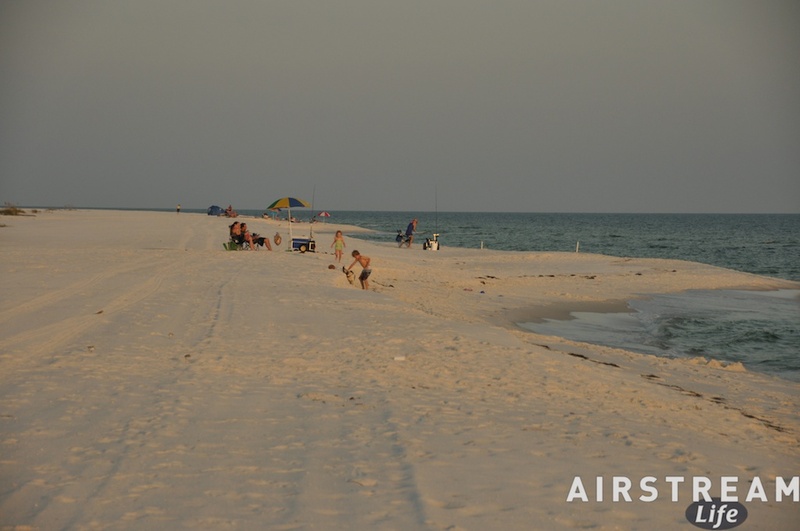 Having learned from prior nights, we wrapped up at the beach an hour before sunset so that we never saw a mosquito. That left plenty of time to rinse off in the campground showers and enjoy a moment of coolness. We were lucky last night; our neighbors’ charcoal fire was carried off in a different direction by the wind, so we finally got that blissful evening of fresh breezes in the trailer while Eleanor made a fine dinner for all. That brings us to today, the Monday that we will pretend is Sunday, part 2. We have no plans. We may go somewhere, we may not. Looking ahead on the travel schedule I see many long days of driving and absolutely no beach time, so this is our last chance to soak up la dolce far niente and we will make the most of it, or perhaps more accurately, the least of it.